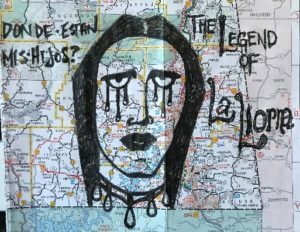 Show notes: Is the tale of La Llorna just a fable to scare the kiddies or does her ghostly form really roam the banks of the rivers and arroyos of the southwest searching for her dead children? Join us for this hauntingly epic tale as we tell the story of the vain Maria and her handsome ranchero. CategoriesPodcast Tags#podcoalition, #podernfamily, #Podgenie, arroyos, children, creepy tales, culture, curse, dark tale, defunct town, disappear, encounter, enduring legend, esoteric, esoterica, esotericism, event, Experience, folklore, frightening tale, ghost, handsome ranchero, haunt, hauntings, hidden, History, horror, investigate, La Llorna, legends, local lore, lost history, most haunted, mysterious, Mystery, obscure, oddities, Oddtober, orbs, phenome, photos, Podcast, scary story, sightings, spirit world, spirits, spooky, strange, supernatural, travel, unexplained, unknown, vain Maria, Where are my children?